And indeed, the 3D is truly magical, making me gasp in awe at times. The snowflakes appear to be really coming down around you, the party ribbons and silk curtains threaten to whisk you away, and, ladies, you will practically drool over the bling that quite literally pops out at you. Unfortunately, despite the gorgeous cinematography and the excellent performances from the actors—most notably Leonardo DiCaprio (who appears to be aging like wine)—the film falls short of being truly spectacular because the glitz and glamour ultimately overshadow the heart and soul of the movie. When the credits start rolling, you can’t help but feel cheated. It’s pure eye candy with little beneath the surface; there is never an emotional connection made between the characters and the audience. The storyline, for those who don’t remember reading the book in high school, goes something like this: narrator Nick Carraway (Tobey Maguire) moves to a fancy Hamptons-eque part of Long Island for the summer, close to his cousin Daisy (Carey Mulligan) who is married to wealthy Tom Buchanan (Joel Edgerton). Nick is invited to his next-door neighbor Jay Gatsby’s palatial mansion for one of his infamously decadent parties and they become friends. 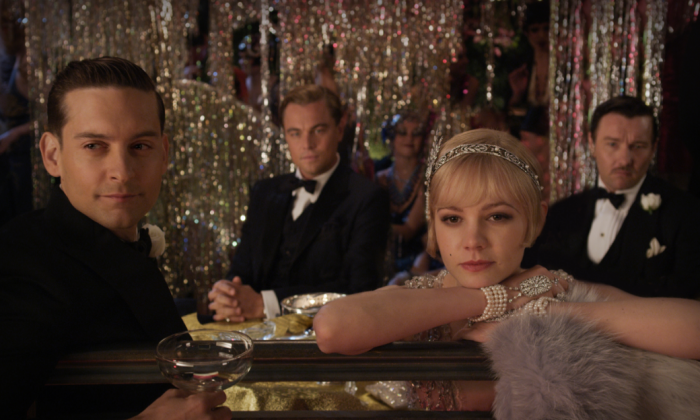 Gatsby, however, has designs on rekindling his love with Daisy, and the rest of the film reads much like a soap opera. The magic of the book unfortunately does not translate to the big screen; instead of focusing on the beautifully complicated and intricate characteristics of Gatsby and the spirit of the hopeful American dream that he embodies, the movie focuses too one-dimensionally on love and betrayal. Despite this, “The Great Gatsby” is still nonetheless highly enjoyable and truly a feast for your eyes. I won’t be too hard on Mr. Luhrmann, as I’m almost certain it is impossible to create a truly satisfying big-screen version of the book. Not to steal another film’s title, but sometimes there is just too much that is lost in translation. At least, in Lurhmann’s version, you will relish in being lost in the trappings of his vividly powerful imagination and artistic eye.